Prevents stiffness of the shirts fabric. 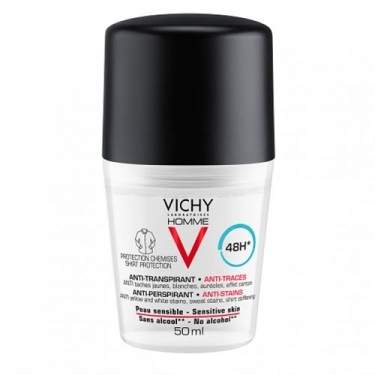 DESCRIPTION: Vichy Homme Deo Roll-on Anti-tâches from Vichy is a roll-on deodorant, which helps control excessive sweating, keeping the skin dry and comfortable for up to 48 hours and without staining clothing. Its soft texture, with antiperspirant regulating agents and anti-stain technology, provides a protective, balancing and softening action. The armpits remain dry, fresh and protected all day.